The battery-free window / door contact Mx-MRC1 powers itself from a solar cell and stores the energy for night operation. A signal is transmitted when the contact is opened or closed. Every fifteen minutes, a signal indicating the current status is also transmitted. The window / door contact and the magnet must be located next to each other when the window or door is closed. They may not be spaced more than .31” apart. Double-sided tape or screw mounting. Before startup the energy accumulator must be charged. 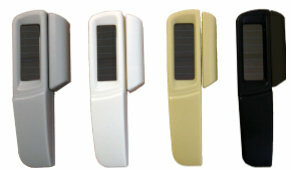 The charging time is approximately 5-10 minutes in daylight or artificial light. Although a full charge will take approximately 24 hours. For testing purposes or for operating the device, the Mx-MRC1 needs to be charged several hours in daylight or artificial light.